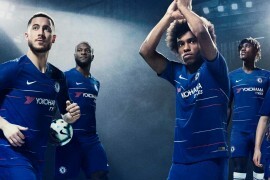 As the football calendar draws to a close, following Barcelona’s European victory and Chelsea’s FA Cup success, the season for new kits takes centre stage. Olympique de Marseille, who remain the only French team to have ever won the Uefa Champions League, have unveiled their new home and away kits made by adidas for the 09/10 season. 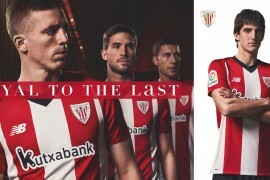 The upcoming campaign will celebrate 110 years of the French football club and to mark the anniversary the new shirts will contain an embroidered logo marking this historic year. I was a fan of Jacquard. I was wondering if we could do better. 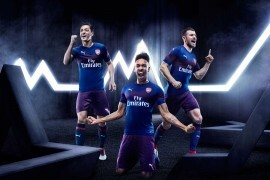 And yet, I love this away jersey! 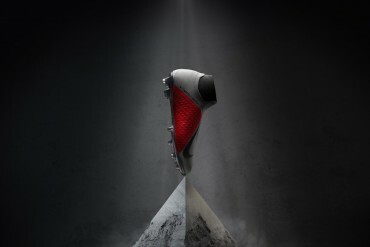 It has a beautiful design. I particularly like the mix of blue. It is a natural colour for the OM: it refers to the sky and the sea. It perfectly reflects the city’s identity. I like it enormously, and it is very comfortable to wear. Meanwhile in Scotland, Heart of Midlothian Football Club (Hearts) have revealed their all new home kit for 2009-10 made by Umbro. It features the introduction of a simple two-tone shirt with traditional collar, and white flashes. White shorts are also back for next season, whilst the team will play in white socks with maroon flashes. The all new home goalkeeper kit is a vibrant electric yellow affair. And finally this week we bring you the news that N-GAGED will be Bristol Rovers’ home shirt sponsors for next season with solicitors Stevens Hewlett and Perkins as the away shirt sponsor. The new training and recruitment company, based in Longwell Green, England were the first business to be pulled out of the velvet bag in the Rovers shirt sponsorship draw, an initiative to combat the credit crunch we informed you of a few weeks back. The draw appealed to a wide cross section of people, attracting attention from large national businesses right through to small local companies. We would like to offer a massive thank you to everyone who has supported us on this, the response has been unbelievable, and we have raised an exceptional amount of money. The success of the draw has been beyond our wildest dreams. It has been three weeks of hard graft, but it has all been worth it. 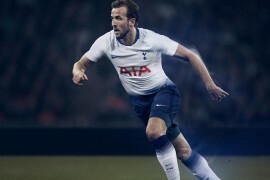 As always, footballshirtculture.com is the place to keep up to date with the latest shirt news.